We are as unique and individual as snow flakes, and due to our very nature 'one size does not fit all'. I found this out very early on in my career when I was teaching youngsters, there is nothing more unique and diverse than 35 5 and 6 year olds in one room! I have honoured and respected this throughout my life and this led to my decision to train as an integrative counsellor when I was researching which course to train with. This training has given me a wide 'tool box' of understanding, techniques and programmes which enable me to work with you in a way that resonates with and adapts to your needs. I work in a supportive, non-judgmental, ethical and safe way to help you make positive changes in your life. Allowing you to explore personal issues, develop understanding and support in reconciling and then moving forwards beyond them. Within our sessions it is not my place to tell you what to do, instead it is my role to help you find solutions and help you to explore yourself, your life experiences and any patterns that occur. The aim is to enable you to gain a deeper self awareness and understanding of yourself, which helps you live a happier and more fulfilled live. When you come to see me the first session is a chance for us to meet and explore you and your life experiences. The session will last up to one hour and gives us a chance to see if we can make a connection. It is essential that you are comfortable with your counsellor and this initial consultation will give you an opportunity to evaluate me and whether you feel you can work with me. Every counsellor is unique and we all work in different ways, so this initial consultation is incredibly important to begin to build a supportive, empathetic and respectful therapeutic relationship where you can feel safe and secure. Once we have agreed to work together, we can discuss how many sessions would best suit your needs. Often this is 6 weekly sessions of 50 minutes with a review at week 5. 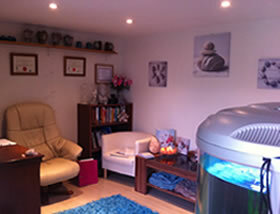 However, and to reiterate we are all unique and I am adaptable with sessions to suit your therapeutic needs.